If you’re looking to improve sales performance, optimize ecommerce, implement marketing automation, expand social media, deliver better customer service, or utilize accurate Configure-Price-Quote (CPQ) – it’s all Oracle. And, the icing on the cake? All of these solutions are integrated, but modular. We offer a breadth of solutions that you can not only buy individually, but can also easily integrate with existing or additional solutions as your business needs grow. 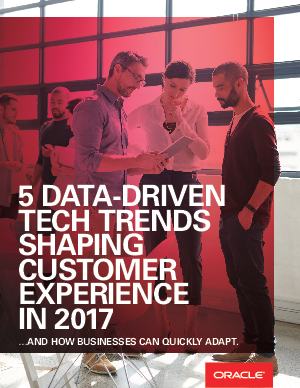 Adapt your customer experience strategy to new technology in Forrester's navigate the future of CRM in 2017 Report.